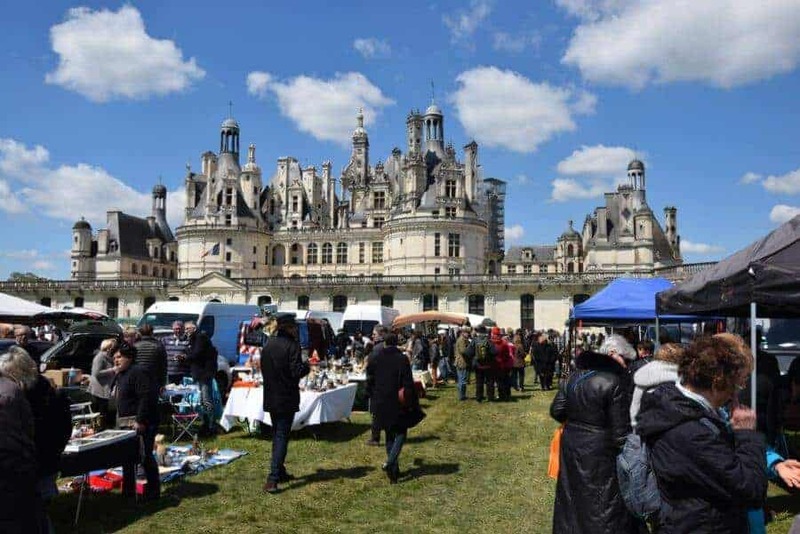 Flea Market: 23 best flea markets in France (2019 update) 4.1933333333333 out of 5 based on 150 ratings. 150 user reviews. Lyon is well known for its culinary credentials. Legend has it that France’s gastronomic capital has more restaurants per square mile than anywhere else in Europe. However, Lyon isn’t only about Andouillette, Coq au Vin or marrons glacés. The city’s flea market scene is one of the most attractive in the region. The Déballage Marchand de Lyon and the Puces du Canal enjoy international renown. A true paradise for fans of bric-a-brac and antiques, Les Puces du Canal gathers every week around 400 vendors and exhibitors and is considered France’s second-biggest weekly flea market behind the Marché aux Puces de Clignancourt (St-Ouen flea market). Les Puces du Canal is an unusual experience and well worth a visit for flea market enthusiasts and antiques collectors passing through Lyon. 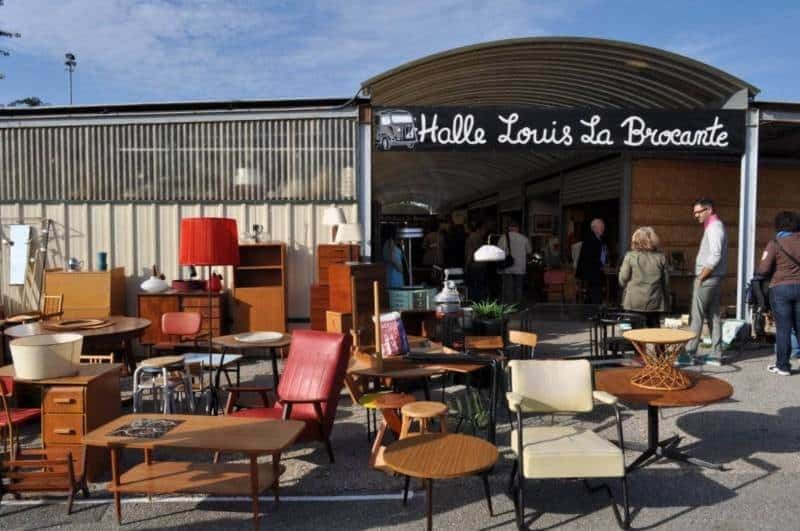 At Lyon’s Puces du Canal you will find old furniture and vintage decor and, in fact, almost anything related to design, retro and vintage you could think of. Lyon’s Les Puces du Canal is a flea market that deserves to be mentioned as not only one of the biggest, but also one of the best in the whole of France. Luckily, this flea market is open even on three days a week (Thursday, Saturday, Sunday). While on Thursdays and Saturdays only professional stallholders are allowed to sell their goods, the general public is welcome to set up booths on Sunday. The result is an eclectic and lively mix that characterises the Puces du Canal flea market. When: Thursday and Saturday 08:00 a.m. to 12:00 p.m., Sunday 06:00 a.m. to 2:00 p.m. Located between Lyon and Geneva, the Farfouille de Leyment is the second largest open-air flea market in France after the Grande Braderie de Lille. 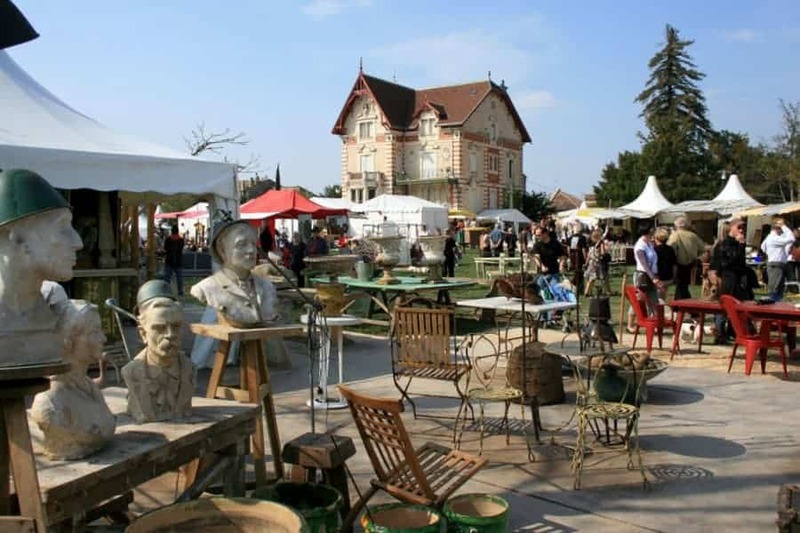 With more than 1,700 vendors over a 20km area, the Farfouille de Leyment is one of the few outdoor antiques fairs of this scale and quality in France. As a result, bargain hunters come as far as Switzerland, Italy, Germany, Belgium, Netherlands, and Austria to attend this event and to try their luck at bringing home something unique. In 2016 and 2017 the Farouille de Leyment did not take place due to security concerns, but 2018 should see the return of this exceptional event (despite not yet being officially announced). Paintings, postcards, trinkets, old furniture, lighting, old books, vinyl records, decor objects, stamps, pottery, antiques are some of the many items that can be found at this event, which, once a year in August, brings together more than 1,700 merchants and around 70,000 visitors. 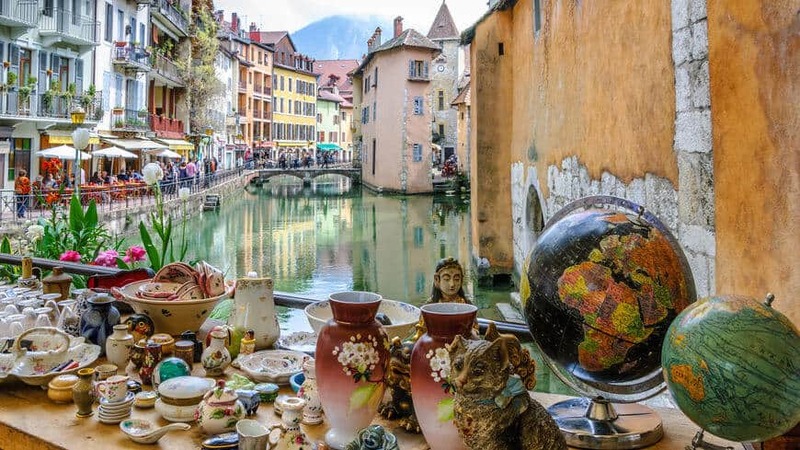 Gathering between 150 and 200 professional vendors, the monthly flea market in Annecy’s beautiful Quartier Viarme can claim bragging rights for the best location among France’s brocantes, with one of the most stunning sceneries you will get to see. The brocante’s location in itself is an invitation to wander through the alleyways of the old town, between booths selling antiques as well as locally manufactured handicraft. In fact, a lot of the goods on offer reflect the city’s status as a gateway to the Alps. Vintage snowshoes and skis, rustic Savoyard cheese-making equipment and boxes full of cowbells all regularly turn up, alongside more traditional wares like antique paintings, pottery and furniture. All in all, the monthly flea market in Annecy provides yet another reason to visit this stunning, alpine town and soak up local culture. 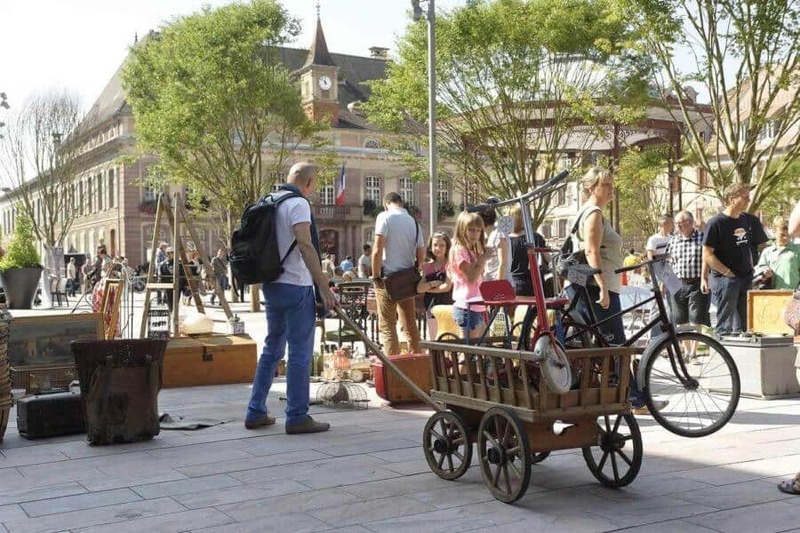 Belfort’s sprawling, open-air flea market is held on the first Sunday of each month, from March to December. The Brocante de Belfort gathers more than 120 professional antique dealers selling a wide variety of quality merchandises: antique furniture, crockery, paintings, knick-knacks, militaria, books, collectibles, postcards, enamel plaques from Alsace, linens, toys, glassware, copperware, wooden items of all sorts and some furniture. No wonder why antique enthusiasts and seasoned flea market shoppers come as far as Alsace and Switzerland to visit this flea market! Located in the Franche-Comté region, the Brocante de Belfort is also a great place to find collectibles of all kinds from the northeast of France: Alsatian bowls and milk pitchers with flower motifs, grey stoneware jugs, classic ceramic baking molds, and folkloric dishware from Lorraine. The presence of an antiques expert on the premises of the flea market, helps deter crooks from selling fake merchandises or forgeries. Knowing some idioms belonging to the French jargon of junk, will grant you an undeniable advantage when it comes to haggling at French flea markets. Wow, this is cool. I never considered visiting a flea market on a trip but I can see how it would be a very memorable cultural experience. Thanks for sharing this great list. A little map showing them would also be awesome if you could. Are thse still operating in Mid november? I am coming over. Hi Kevin, most flea markets are operating all year long except around NYE, Christmas and August 15th. Also, keep in mind that days and hours of operations may change because of national holidays. Vanves is good, and while the prices are generally high I have found one or two real bargains there, as well as a couple of really lovely stallholders who are always ready with a joke and a smile. However Montreuil has come down in the world; there are only a few good antiques stalls among a sea of cheap clothing and mass produced cooking pots. A few bargains can be found along the rather seedy alleyway leading to a pedestrian bridge over the peripherique, but it’s pretty depressing. Hi LLL, thanks for asking this very practical question indeed! First, you will need to find the nearest garage sale to your location; in order to do so, you can visit http://www.vide-grenier.org, a site that lists all flea markets in France and in Paris. From here you will be able to book a place by filling a registration form, providing a photocopy of your ID, along with a deposit check, ranging generally from 7 to 15 euros per meter. Keep in mind that every flea market has its own regulations, particularly in Paris where opening a stall is generally limited to professional sellers. In St Ouen (Clignancourt) for instance, occasional sellers can apply directly to the Town Hall/City Council of Saint-Ouen (Theodora Louttelier, assistant market, which will guide you through the steps to follow: +33 149181455) for a shopping licence. First come, first served according to availability! Your application will then be subject to a vote led among a commission which will decide whether or not your items deserve to be exposed. Another practical resource is the SPAM (http://www.spam.fr/), which stands for “Société Parisienne d’Animation et de Manifestation” This company organizes professional flea markets and garage sales in Paris and outside of Paris. Hi. Good review. Makes an interesting read. Just got me thinking if it would be worth visiting a French Market for luxury bags. My wife loves vintage Hermes, Chanel & LV bags. Would make a good little holiday and also buy a couple of bags for my wife. Are there any good Vintage Fashion Markets in France? any help, advice, guidance… welcome. #2. Beware of cheap copies of luxury bags: sorting real vs. fake requires a pretty good knowledge of a brand in particular. #3. Don’t be afraid to buy a damaged Chanel bag if you know for sure it’s authentic. You will be able to take your bag to the “Chanel Spa” and they will do everything from re-dyeing your bag to restitching or even adding new hardware. Just go to any Chanel boutique, and they will send it off for you to get fixed. Of course it’s going to cost you but they do an amazing job. It’s a long process (it can take up to 3 months to get your bag back from the spa) so if you just have a loose stitch or maybe a small mark on the leather, a lot of shoe repair shops also do handbag repairs and they can take care of the smaller less Chanel specific fixes (like dyeing the bag or adding new hardware). I hope this information will be helpful :) Happy thrifting time in France! How does one arrange for shipping once you find a good bargain? uShip is one options. And if you browse the web, you will be able to find other services just as good and cheap, like http://hedleyshumpers.co.uk, http://www.chudleyinternational.com or http://www.shipsms.co.uk/antiques-fairs. Well, it depends where you are located. Also, most flea markets operate on Saturday and/or Sunday. Are you based in France? Could you provide the name of the author of the picture and I’ll feature it with a © sign. This very image is available as “creative commons” on hundreds of wallpaper sites like yours; so I’d rather give the author’s name, than any random wallpaper website. This would just be unfair to mention your website, and not the 999 others ;) Thx! Thank you for this! What would you recommend for silverware and flatware? Hi Duane! Well, generally speaking, silverware and flatware can be found at Porte de Vanves Flea Market or Clignancourt/St Ouen. Since Clignancourt harbors high level antiques merchants, you might end-up paying a pretty fee for things you could also find at Vanves. So I’d try with Vanves first, and then head to Clignancourt to check for more. 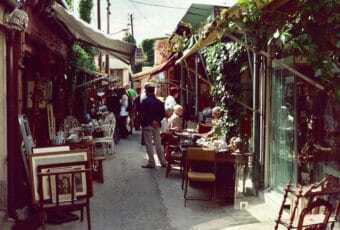 Planning a trip to Toulouse and Montpelier on the first weekend in May, is the Montpelier Saturday flea market any good? Also ant recommendations for between these two places ? The Marché aux Puces de la Paillade (Espace Mosson), the oldest and the biggest fleamarket of Montpellier, welcomes once a week up to 400 merchants (6 am to 1 pm). This market however has lost some of its shine: today it merely sells second hand clothes, shoes & bikes. Nevertheless it is possible to find something, but you must be dogged fan and look hard. Worth to tick it in your list, but do not hope to dig a hidden gem in this trash. I’d recommend instead the “Brocante des Allées” located in the Allées François Verdier in Toulouse: yes it’s a bit pricey compared to the Place Royale du Peyrou, but you’ll find a lot of variety as well as items of quality (120 antique dealers & flea merchants). The only drawback is that this flea market only runs once a month (first friday, saturday and sunday of the month, from 7 am till 6 pm). So if you’re planning to go there on the first weekend of May, that’d be perfect! Where is a good flea market for lights and mirrors ? Hi Nicola, most flea markets in France host merchants who sell lamps and mirrors. However, if you’re looking for top quality items (which come at a price though…), I’d recommend you to go to St Ouen/Porte de Clignancourt flea market. Hi is it easy to trade at these markets? Hi Leo! Generally speaking, each market has its own set of rules when it comes to trading regulations (space reservations, cost, insurance, unpacking/packing time, size of stalls, type of merchandise allowed/prohibited, and so on). Some of them have a website, or a least an email/phone number, so you can verify what the pre-requisites are. I would recommend to get in touch beforehand with the organizers of the market you’re interested in. Any ideas on how to get a bulky cupboard from France to the UK? Consolidated shipping is a great option . Transporters regularly drive between France and the UK and can take care of your bulky cupboard for less than £150. We regularly use Shipply.com (secure, get the job done, reactive and affordable). Hi, can you suggest any near Calais? We are hoping to pop over for a weekend day trip and would love to come back with some wonderful finds! Hi Samantha, thanks for asking! Well, if you’re planning to spend a weekend in Calais, you should indeed carefully plan your “flea market trip” ahead. As a matter of facts, Calais does not seem to host flea markets on a regular basis; you will probably have to visit nearby villages located in the region. 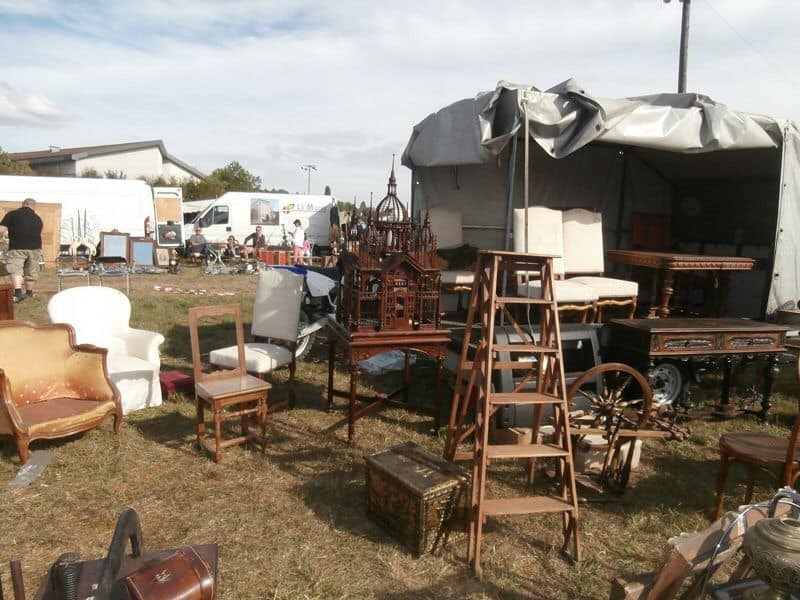 To keep tracks of upcoming flea markets/brocantes in France, visit https://vide-greniers.org/62-Pas-de-Calais/Calais?_otid=home-select , http://onbrade.fr/vide-grenier-departement/Pas-de-Calais/62 or http://www.123brocante.com/Manifestation/Nord-Pas-de-Calais/Pas-de-Calais/62 that list flea market related events in the region. You will thereby be able to make the most of your trip in Pas-de-Calais! 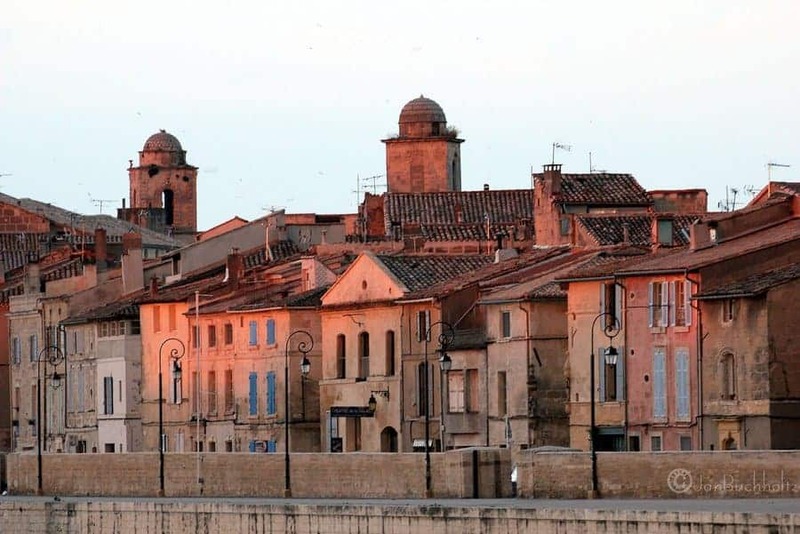 We have recently bought a property in the Charente region and we would like to visit a flea market in that area for furniture, can you recommend anywhere. We are next due to visit in May . Hi Sarah! If you’re planning a flea market trip to Charente Maritimes in May, I would strongly recommend you to have a look at this website: https://vide-greniers.org/17-Charente-Maritime/mai?_otid=navbar-period (17 – Charente-Maritime – Mai 2016). I hope you will find some interesting flea markets among the dozen of events organized each weekend! I will be in Prague, Croatia, and several cities in Italy mid July to mid August of this year. In Italy we will be visiting Venezia, Bologna, San Marino, Assisi, Perugia, Sienna, Chianti, Modena and Verona to name a few. I would love to find some antique oyster plates and some antique maps while I am there. Are there some flea markets that would have these collectibles? Any suggestions on great markets would be very helpful. Thank you so much! I’m actually looking for someone who is interested in importing T-shirts of low price mainly of sto ck lot from Bangladesh. These are solid color of 160 gsm in 6/7 colors. Plz feel free to ask me any questions. useful to buy or sell second-hand or verify if you well go to purchase one in flea market. sale or already sold to know the real selling price. services. We thus answer the lack on the second-hand market mainly. they consider as relevant, the average price is recalculated automatically. the prices based on the sellers will. I’m planning to go south of France (Toulouse, Montpellier) at the end of November / beginning of December. Mostly I’m looking for second hand records. Do you have any experiences where to go best for vinyl? 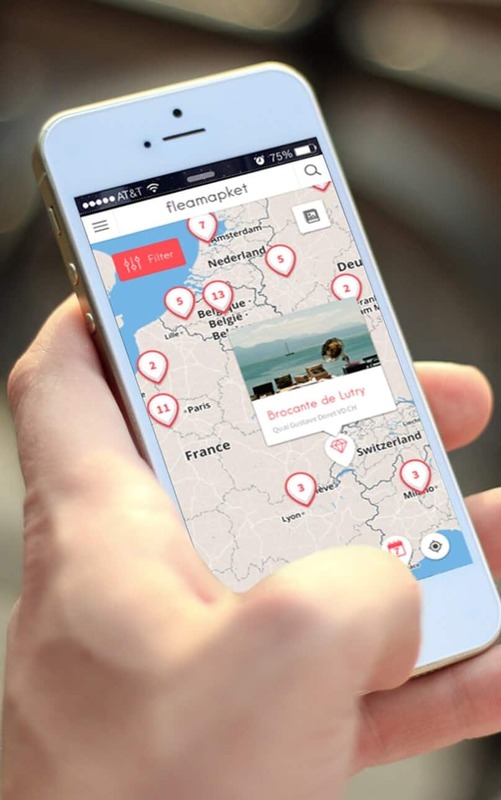 Hi Lisa, if you’re in Paris Monday to Friday, you’ll be able to visit the Paris Saint Ouen Flea market (Saturday, Sunday and Monday from 10 am to 5 pm – Friday is for professionals only): https://www.fleamarketinsiders.com/paris-saint-ouen-flea-market/ . 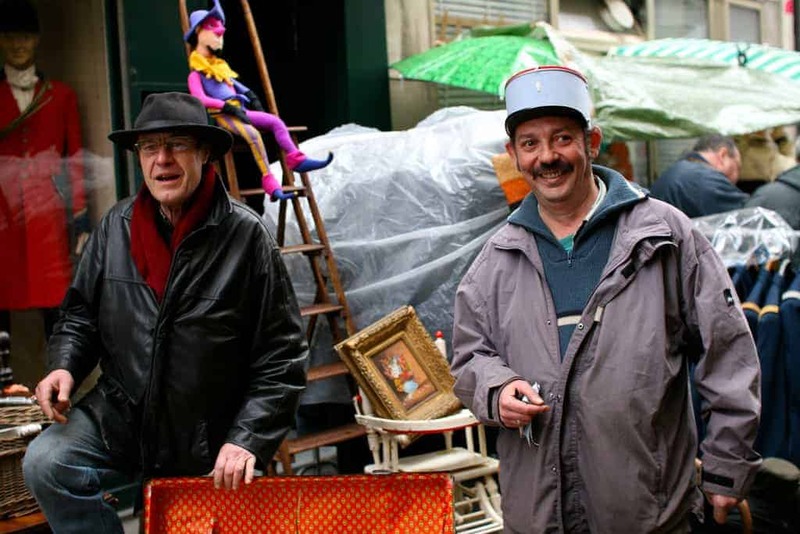 There’s also a daily flea market on the Place d’Aligre in the 12th arrondissement (http://pucesaligre.unblog.fr/). Where can I find a market that sells ladies clothing? I would like to plan a trip to France to buy vintage textiles, primarily embroidered linens and laces, napkins, tablecloths, lace curtains, old silk ribbons and fabrics. I can plan the trip anywhere in France. I would probably be traveling in Sept / Oct or April / May of next year. Thanks for sharing this great tip Brian! Enjoy your trip there, and good luck with the treasure hunt! Hello, would you recommend a few good brocante for religious iconography, art, relics etc in and around Paris for late September, early November time frame? Thank you so much! Hi, I’m an antique dealer from Japan and planning to visit flea markets and shops around east France and south-west Germany in this November. Would you recommend some nice flea markets and shops where I can find a lot of potteries, laces, linens and interior pieces? I can’t travel too far from Stuttgart since I’ve got an accommodation in there. 4-5 hours driving distance should okay. Could you tell me about the cover photo for the article? Is it an actual event or a recomposed photo? Thanks for the great advise! I’m going to go to France next year and would love to know what are the best markets just outside and around Paris. Also must you speak French to get the best deals? I don’t speak at all and my husband speaks just a little. We will be near Sarlat for the month of September 2018. We just found your article on the Toulouse Flea Market. We fly into Toulouse on 31/8 so we will go to the market the next day. Do you have other suggestions for markets within a couple hours drive from Sarlat? Thank you for the very informative web site. If you already have an itinerary in mind, I’d recommend you to have a look at https://vide-greniers.org/ which lists all flea markets and garage sales/yard sales in France. 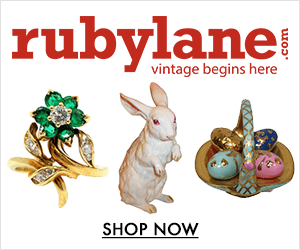 Depending on what you are looking for (antiques, books, trinkets, clothes, etc) this site can point you in the right direction. In what town/city is the head picture taken? What would be some scenic markets that you’d recommend? Visiting Paris and cities north to Verdun…I am looking for antique and vintage buttons. Got any recommendations to narrow the search?? we will be in France from july 20th-august 4th, we plan a trip by car, LYON-GRENOBLE, AVIGNON, MONTPELLIER, TOULOUSE, BIARRITZ, BORDEAUX (Charente). I am addicted in fleamarkets and I would love to get some hot tipps from you for the time we are there. Many thanks! There’s also a calendar available with the Premium version (as well as all flea markets’ opening days and hours). Which market is better for Japanese Cloisonne items and other Japanese art?